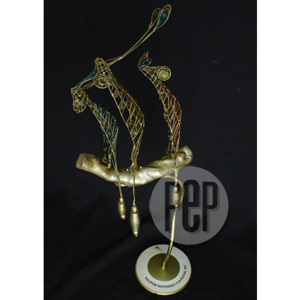 The Best Full-Length Feature Film winner will receive this Gawad Balanghai trophy (in photo) and a cash prize of P200,000. Just like last year, less than ten films competed for the full-length feature category of the Cinemalaya Philippine Independent Film Festival. Two of the 10 finalists last year, Larombata by Khavn dela Cruz and Mga Anino sa Apuhap by Domingo "Jon" Lazam III, were both disqualified for failing to meet the deadline. In the third edition of Cinemalaya, 2,999 and Sinungaling na Buwan (Liar Moon) were pulled out from the competition. The organizing committee of Cinemalaya had announced earlier this year that ten films would vie for the title of Best Full-Length Feature Film, a Gawad Balanghai trophy, plus a cash prize of P200,000. The 10 finalists chosen out of 240 submitted screenplays for the full-length category include: 2,999 by James Arnold B. Ladioray, Endo by Jade Castro, Kadin (The Goat) by Adolfo B. Alix Jr., Gulong by Romualdo "Bona" Fajardo and Anna Liza "Lyn" Fajardo, Ligaw Liham by Emilio "Jay" Abello VI, Pisay by Auraeus Solito, Sinungaling Na Buwan (Liar Moon) by Eduardo Lejano Jr., Still Life by Katrina Flores, Tribu by Jim Libiran and Tukso by Dennis Marasigan. However, several months before the film festival, one of the short-listed directors decided to pull out from the competition. According to Ed Cabagnot, festival programmer of Cinemalaya, James informed them last May that he had some problems that would interfere with the production of the film. "He had some specific problems and he said that based on those problems, hindi daw niya matatapos yung [2,999] in time for the festival. Nagpasabi naman siya habang maaga and he returned the money. We were sorry that it happened pero wala kaming magagawa," explains Ed Cabagnot. Cinemalaya granted each of the finalists a seed grant of P500,000. The movie was supposed to be a love story revolving around the 3,000 pairs of shoes of Imelda Marcos and a boy who stole one pair, for poetic justice and for love. The massive shoe collection of the former First Lady, which has attained global, iconic, if not notorious status, becomes the ironic focal point for closure, healing and redemption. Rumors surfaced that a mainstream film company had expressed interest in buying the rights to the film. The festival programmer replied by saying, "I called him up and I asked him if it was true. Actually, James said that he had received offers from four companies. But nothing was really signed." SINUNGALING NA BUWAN. Last Saturday, July 21, was supposed to be the premiere screening of Sinungaling Na Buwan (Liar Moon). A rough cut of the Ed Lejano’s movie was shown at the Cultural Center of the Philippines but due to technical problems the screening had to be stopped. "Nestor Jardin [festival director of Cinemalaya] approached me and I said that I’m agreeing to pull out my entry in fairness to the other directors. I have a finished product but it just so happens that it was not screened in time for the premiere," clarifies Ed Lejano. "It’s still part of the festival but as an out-of-competition entry. Tuloy ang schedule for Sinungaling na Buwan." PEP (Philippine Entertainment Portal) asked the director to describe the technical difficulties that he encountered. "We had conversion problems, we had out-of-synching of the sound with the visuals. One week ago, we were on track but three days before the gala screening, everything that could go wrong went wrong. Wala kaming nagawa, it takes time to render," he narrates. "I’m not happy because it is no longer eligible to win awards in the competition but at least it will be screened in CCP," he ends. Sinungaling na Buwan (Liar Moon) is an offbeat drama about three loves, three broken hearts. A farewell letter from their respective ex-lovers unites all three stories. Each dysfunctional character shares a common experience of falling victim to a pattern of irony and lies. With its intricate plot, their separate stories converge during a performance of a play, revealing unexpected twists linking one another in surprising ways. The Cinemalaya Selection Committee for the full-length feature category is composed of Juaniyo Arcellana, Nestor Torre, Manet Dayrit, and Robbie Tan. Winners of Cinemalaya 2007 will be announced this Sunday, July 29, at the Tanghalang Nicanor Abelardo of the CCP.